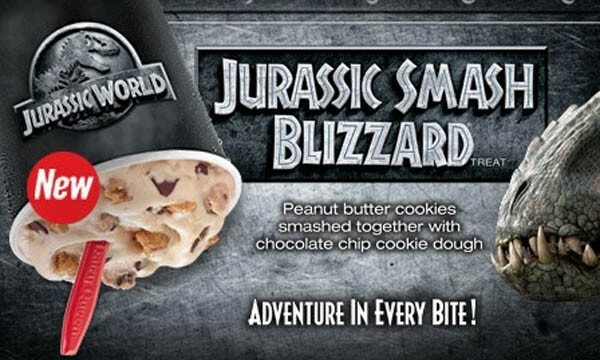 In a co-branding effort with the upcoming Jurassic World movie (hitting theaters June 12th), Dairy Queen has released a completely unrelated Blizzard called the Jurassic Smash Blizzard. The Jurassic Smash Blizzard has peanut butter cookies combined with chocolate chip cookie dough, mixed in the regular vanilla soft serve. 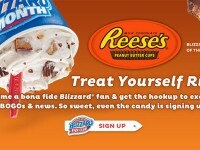 It does sound delicious (as anything with peanut butter and cookie dough is). 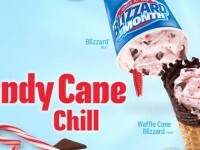 According to Dairy Queen, “there’s an adventure in every bite.” While that statement seems debatable, what isn’t is the limited time nature of this Blizzard. 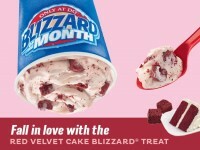 At Dairy Queen, you can get this Blizzard by itself, or in the $5 Buck Lunch (with a $1 upgrade fee).